Disclosure: I went on an all-expense-paid press trip to Las Vegas sponsored by VegasGirlsNightOut.com. Thoughts are my own. 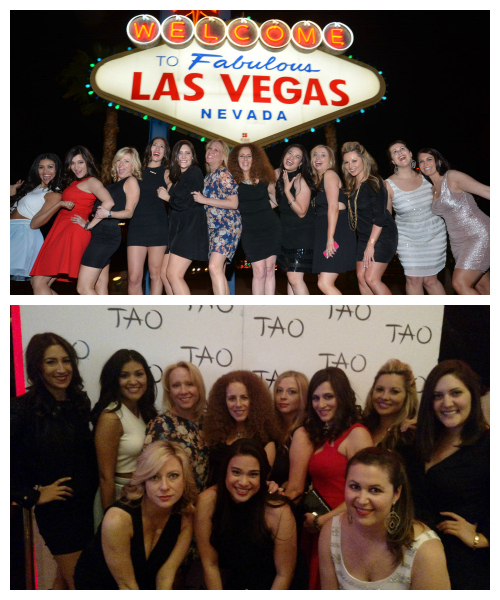 I recently went to Las Vegas with the awesome ladies from Vegas Girls Night Out. It was my very first time in the entertainment capital of the world and I felt very lucky to have experienced an all-girls weekend getaway planned by local Vegas insiders. 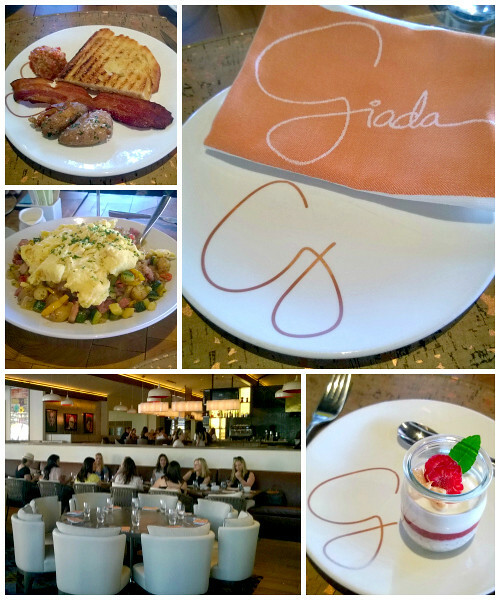 Our Saturday started off with brunch at the Giada, the first-ever restaurant of celebrity chef Giada De Laurentiis. The restaurant is located at The Cromwell and has a very warm and inviting atmosphere. 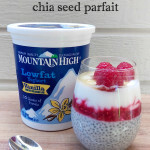 I enjoyed the food but what really stood out for me was the Chia Seed Parfait (see bottom right photo below). That one was heavenly! Immediately after brunch, we headed straight to the LOOK Style Society where we had our hair, makeup and nails done. I was really impressed by the whole place! It was huge! They have a blowout bar, a nail lounge, and a makeup lounge. A lady named Morgan and a guy named Henry did my makeup and hair respectively. And, man, did they do an awesome job! I’ve never felt more beautiful! They were the best ones that ever did my hair and makeup! I just wish they’d open a branch here in the SF Bay Area! 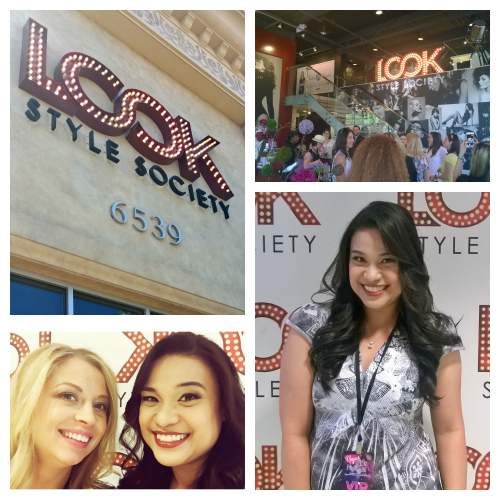 If anyone plans to go to the LOOK Style Society, be sure to ask for them! They won’t just work on your hair and makeup, they’ll also make you feel good and comfortable while doing it. As soon as everyone was done, we went back to the Luxor Hotel so we can change into our evening dresses, then we went to Carmine’s for dinner. 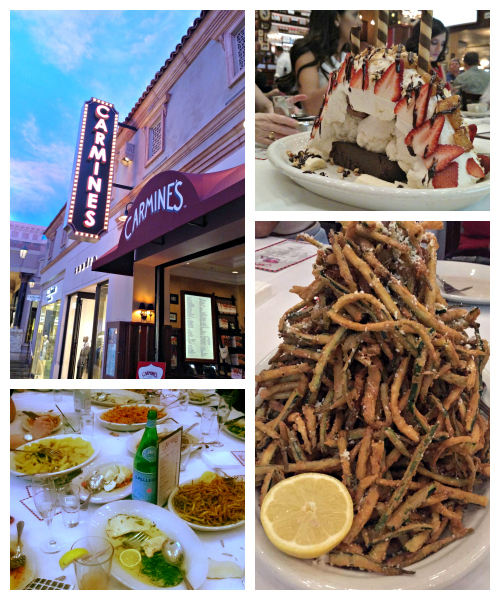 Carmine’s is located at the Forum Shops at Caesar’s Palace. They served us so many dishes but the ones that I loved were the Fried Zucchini (shown in photo), Stuffed Mushrooms, Chicken Lemon Butter, and the Titanic (shown in photo) which has a large brownie topped with large scoops of ice cream, chocolate syrup, whipped cream, strawberries, bananas and more! We got really stuffed by all the food they served us. There were 7 dishes on our table not including dessert! Woah! But we were ready for the next item on our agenda for the night — the Boyz II Men show! Jackie of MomBlogSociety and I were really excited about this one because we’re both HUUUUGE fans of the group! VegasGirlsNightOut.com has exclusive access to the best seats in the show so you won’t have to squint your eyes just to see them! I loved singing along to classic Boyz II Men favorites like On Bended Knee, End of the Road, Song for Mama, Water Runs Dry and a lot more! They also had an awesome Motown tribute that had the audience singing along. They also gave out long-stemmed roses to some people in the audience and I’m proud to say both Jackie and I got one! Woohoo! Obviously, they’re not as young as when they reached the peak of their career because that was about 20 years ago, but their voices don’t seem to be aging at all. I feel like I’m still hearing the Boyz II Men of the 90s! Their voices still managed to bring out my emotions as I sang along. So talented! 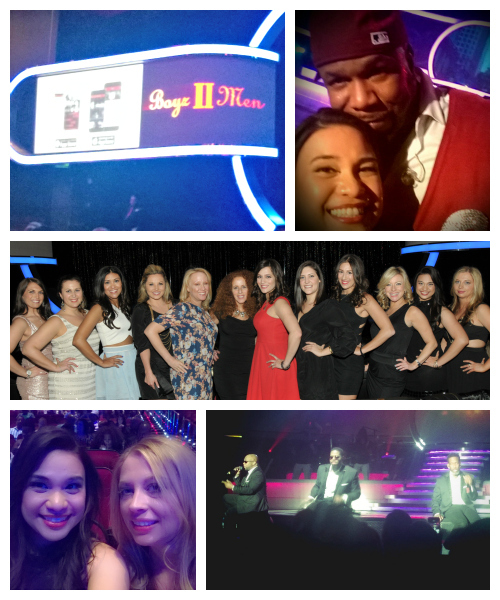 I must admit that it was my dream to be able to watch Boyz II Men live AND be able to meet them in person. And guess what?! VegasGirlsNightOut.com made that possible! After the show, we were given the chance to do a meet-and-greet with them. And anyone who books with VegasGirlsNightOut.com can too! Just be sure to choose the meet-and-greet option when you do your planning! After the show (which I’d recommend to any Boyz II Men fan), we went to the “Welcome to Las Vegas” sign. I think every tourist should get a picture taken there! The photographers there were very friendly and funny so you won’t feel awkward about doing those epic poses! We then went to Tao night club where we had a private table with bottle service. I appreciated the VIP treatment that was given to us because of VegasGirlsNightOut.com. I could see the long line of people who were waiting to be allowed in, but if you book with VegasGirlsNightOut.com, you’ll receive VIP entry. Awesome! The following day was more laid back for us. We started our day around noon and had a pool party at Moorea with the blokes of Thunder From Down Under. Honestly, I was kind of intimidated at first. I mean, it’s not everyday that I get surrounded by handsome guys with killer abs. But as we began chatting with them (you can see me explaining my work as a blogger to Eddie on the top photo), I slowly felt more comfortable. Plus, it really helped that he looked so much like Chris Evans a.k.a. Captain America. Captain America’s nice. LOL! We were given some free time after the pool party and were offered a professional tanning session with BOLD Body Bronzing, but I opted out because I wanted some time to go around the Strip. Okay, who am I kidding? I just checked out the other parts of the Luxor Hotel and the Excalibur Hotel and slept! It was great to have some relaxing alone time after all the activities we’ve had so far! Sunday dinner was at Tacos and Tequila. Because it’s located at the second floor of the Luxor Hotel, we didn’t have to travel by limo. Of the dishes they served us here, I really loved the Chopped Salad and those bite-size brownies! It has just the right amount of sweetness to it! At this point, I guess it would seem redundant to say that I had so much fun because of everything VegasGirlsNightOut.com had planned out for us. And if my experience isn’t reason enough, here are 5 other reasons to plan your girls-only Vegas trip with them! VegasGirlsNightOut.com is the first of its kind boutique concierge service and is designed for women by women. Women know what women want. We understand each other. VegasGirlsNightOut.com currently offers 6 pre-planned party packages: Thunder Storm Through Vegas, Boyz Crazy Package, Divas Day Out Package, Girls Night Outback Package, Glamour Girl Package and Naughty Girls Weekend Package. This way, you can choose one and book right away! Done! If the pre-planned packages don’t suit your group, you can also create your own customized party package to fit your group’s specific needs. VegasGirlsNightOut.com offers its customers exclusive pricing for each activity, show and nightclub access. Pre-planned party packages can be booked online 24/7 on VegasGirlsNightOut.com adding extra convenience for guests traveling from all over the world. This is a big advantage VegasGirlsNightOut.com has over other companies in their industry. The women of VegasGirlsNightOut.com have experienced all the things they’re offering on their website so they’ll know if a certain package needs tweaking based on any expressed preferences. They say what happens in Vegas stays in Vegas. But with everything I’ve told you, that’s not always the case. My experience with them — watching the shows, dining and hanging out with the ladies of VegasGirlsNightOut.com and other ladies of the press — was exceptional. It’s one I’ll never forget. 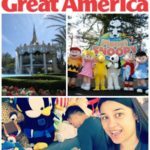 If you’re planning to go to Vegas, be sure to check out VegasGirlsNightOut.com so you can have an experience you’ll always remember, an experience you’ll be proud to share with everyone. Because with VegasGirlsNightOut.com, you won’t want those memories to stay in Vegas! Disclosure: I went on an all-expense paid press trip to Las Vegas sponsored by VegasGirlsNightOut.com. Thoughts are my own. What a fun trip! Makes me wish I were a famous blogger and got to go on these trips. Woo-hoo! Vegas can be an awesome experience for a tourist! My 1st husband and I went there every 6 months for vacation. We stuck to the Strip and went down to Fremont Street, too. But we divorced, and my second husband lived in Vegas, so I moved there. I lived in Las Vegas for 12 years, and there is so much more to see of the area than the Strip. Valley of Fire, Red Rock, Mount Charleston, the Dam….the beauty of desert is just gorgeous! Anyone planning a Vegas trip should set one day aside to discover stunning landscapes! Wow, you look great. It sounds like you had a lot of fun. I would love to have a makeover. I can’t remember the last time that I got fixed up. This looks and sounds like so much fun I have never been to Vegas but would love to go there someday! I’ve always wanted to go to Vegas but just haven’t. Now I think I need to get some people together and go. Thanks for the great review. This is awesome! We just moved out to Las Vegas for my husband’s military job and this sounds like a good way to have some fun. I was surprised at how cheap some of the packages were considering how much show tickets can be in this town! I sort of enjoyed Vegas, but two things REALLY spoiled it me. One was being constantly approached by salesmen, and the other was constantly having the calling cards clicked in my face after dark! That would stop me returning. HEY there is something for everyone in Vegas. This is going to be so much fun.thanks so much for sharing. What an awesome opportunity! Looks like you had a blast! Looks like you had a very good time. Thanks for sharing. This sounds like a great way to plan a fantastic trip to Vegas. 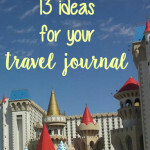 Just a few of the items on your itinerary would make for a great trip. Thanks. I have never been to Vegas. I would love to go one day. It sounds like you had a wonderful time! I will have to remember to use VegasGirlsNightOut.com if and when I eventually get to go! I would love to do this! Especially the pool party with the Thunder from Down Under guys! Maybe one of these days….. Sounds like you had a great time. If I’m ever going to plan a trip to Vegas, I’ll keep VegasGirlsNightOut.com in mind. From the photos and write-up, it sounds like you had a fabulous time. The last time we were there I kept winning and my husband kept losing. Ended up having a great time at no cost to us. Can’t beat that! I will have to check them out. Planning a trip to Vegas very soon! It looks like you had a wonderful time. I have never been to Las Vegas, but if I ever decide to visit I will definitely use VegasGirlsNightOut.com. Thank you for sharing this review. I’ve never been to Vegas, and it’s definitely on my bucket list. It looks like you had so much fun! I don’t have many (any) girlfriends, so the next time you use the website to plan a girls night out, please include me!! Thanks! 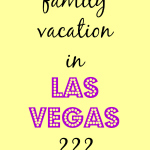 I have been to Vegas several times only with my spouse I’d love to do girls trip after reading this!!! The food looks so good. I want the zucchini and the brownies. 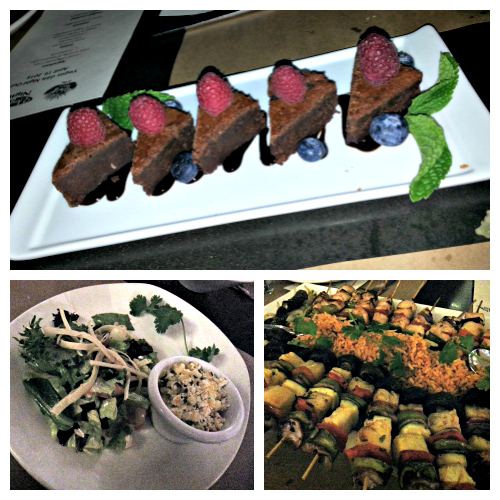 Looks like ya had a great time and the food looks awesome! Sandra Watts recently posted..A little pampering is in order, Win a $500 Sephora Gift Card! What a great idea…this wold be perfect for planning a bachelorette party. I have never been to Vegas but soooooooooooo want to go at least one. I went to Vegas ten years old and can’t wait ti go back. pretty sad huh? sigh.. gotta get there one day! I want to visit now just for those desserts! It looks like a good time. I’m afraid I’d lose too much money gambling. Great photos! Looks like a really good time. Vegas is only a 4 hour drive away but I have never gone with just us girls. I would like to do this sometime. If someone had just mentioned this to me, I doubt I would have thought it would be that great. But reading this post, man, I want to do this! Have my hair and makeup done, get all dressed up in a special dress, fancy dinner, laughs & good times, oh boy, lemme at it!! Oh, my goodness, if I went to Las Vegas they might never get me out of the restaurants, lol! I’ve never been, but it would be fun! Wow, it sounds like you had a great vacation! VegasGirlsNightOut sounds like they really know what they’re doing to make sure everyone has a terrific time; Thanks for posting! Everything sounds so much fun and exciting, but the main thing that stuck out to me here is the Boyz II Men! I so love them and grew up listening and watching them, one of my favorite groups ever! Girls night Vegas has something for everybody. This sounds like a great trip! I know I could use some time in Vegas, but I’d be scared to go without someone there who knew the local sights, sounds like VegasGirlsNightOut really knew what they were doing! From food to cheap packages, I would love to visit! Thanks for the post! ive never been to vegas because it never sounded appealing. your vegas sounds awesome, will chekc this out! Wow! Vegas would be great! Just wish I had the money to go!